So, I did sort of promise a post on the cool things of the Victorian era, right? The Victorian Era is not completely frightening. I've done some preliminary, Wikipedia-level research for my next story idea and thought I'd share some of the cool gadgets that may make an appearance in my story. The Victorian Era--which officially started in 1837, when Queen Victoria ascended the throne, and ended in 1901, when she died--is a large span of time. So, as one can imagine, a lot happened! That's why this is going to be multiple posts. The railroad grew across Britain. The first steam railway, the Liverpool and Manchester Railway, was built in 1830. By the 1850s, Britain had 7,000 miles of railways. By 1900, there were 18,860 rail miles. The Tube was built from 1854 and opened in January 1863, with gas-lit wooden carriages led by a steam locomotive. 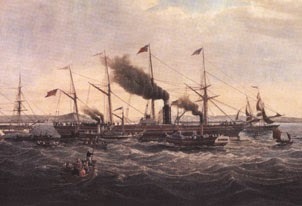 Steamships actually pre-date Victoria's reign; the first sea-going steamboat traveled from Leeds to Yarmouth in 1813. But with Brunel's SS Great Western making regularly scheduled trans-Atlantic journeys from 1838, an era of steam ocean liners began. Eventually, this would lead to the Titanic. First, a little note about Daguerre, the French inventor of an early form of photography called the Daguerrotype, introduced in 1839. Problem was, early photography took a really long exposure time to capture the image. 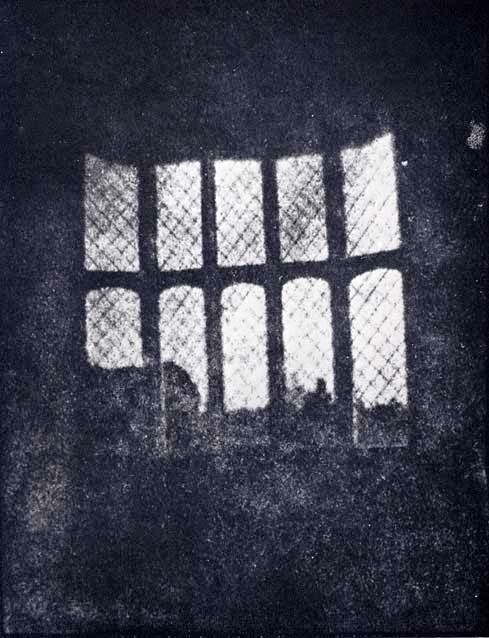 William Fox Talbot later read about the daguerrotype, then created the calotype process, which created a negative, which could then be used to make multiple prints. what may be the oldest camera negative in the world. From Wikipedia. In 1884, George Eastman invented a type of film, to replace glass plates. And now we take pictures on our cell phones. The light bulb was invented in the 1870s. The telephone was invented by Alexander Graham Bell in 1876. The gramophone was introduced in 1877 (the Victorian era's version of an iPod). The telegraph (Victorian email?) was introduced commercially in 1838, being strung alongside the many railroads of the time. In the United States, Samuel Morse--yes, he of Morse Code--independently developed the telegraph. Soon, telegraphs were installed in post offices so one could send a telegram. Wireless telegraphy (email over wifi?) was developed in the 1880s and 1890s, most famously by Marconi. There are plenty more cool things about the Victorian era. There will be more posts. There was wireless telegraphy?! Whaa! How on earth did that work? I know I've already said this, but I LOVE the Victorian Era. So many super cool and amazing things going on in the world. I went to a steampunk art exhibit a few years ago, before I knew anything about steampunk and it blew my mind! I can't believe they had a steam-fueled tube! That's scary. Lol! Can't wait to see what else you're finding! Err...I'm guessing it had something to do with radio waves? I'd heard of steampunk, but I'd never really read it or saw anything of it until maybe the Robert Downey, Jr version of Sherlock Holmes, which was sort of steampunk-ish. Plus, I'm reading the third Parasol Protectorate book now and LOVING the casual way the characters mention telegraphs and blimps. And you know, that version of Sherlock was kind of steampunk-ish. I love the clothes, but don't know much about the era so this post was great for me!